In early 2017, film director, Nancy Ghertner, was invited to screen the documentary, After I Pick the Fruit, at Hobart and Williams Smith Colleges. The March 6th screening was sponsored by JOY. This youth group, Justice Organization for Youth, is sponsored by Rural and Migrant Ministry and is based at Liturgia in Lyons, New York. The group used the screening as a fund raiser for their future activities. A supper was served and the film was introduced by youth leaders. After the film was screened a panel discussion took place. Two of the panelists were youth whose families were part of the film’s stories. This added incredible insight into the journeys and crisis which were included in the film. 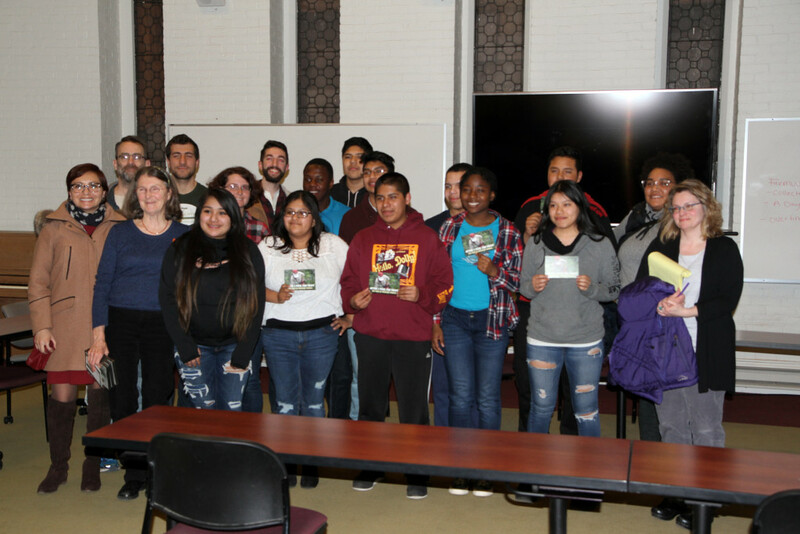 Director Nancy Ghertner and JOY mentor Gabriela Quintanilla also answered questions about farmworker justice and immigration rights. The audience included students, community members and faculty from Hobart and William Smith Colleges and Sodus Central High School. This documentary was released in 2011 and saw extensive university and community group screenings over the last 6 years. In the midst of renewed oppression by the Federal government against immigrant farmworkers the film has taken on renewed meaning. Youth group sponsoring the film.